As you're starting to see, the Windows 2003's Terminal Server licensing environment is extremely complex. It's probably also fairly obvious that the licensing service plays a central role. As you're starting to see, the Windows 2003's Terminal Server licensing environment is extremely complex. It's probably also fairly obvious that the licensing service plays a central role. In Windows 2003, this service builds on the licensing functionality that was available in Windows 2000. In Windows 2003 Terminal Server environments, the TS licensing service must be installed on a Windows 2003 server. That server can be any server in your environment, and it doesn't have to be a server that's running Terminal Server. Most companies install the TS licensing service on a standard Windows 2003 file and print server. The TS licensing service can be installed on any Windows 2003 server. It does not have to be installed on a domain controller. Furthermore, this installation can be done at the time of the OS installation or at any time after that via the Control Panel (Control Panel | Add Remove Programs | Windows Components | Terminal Services Licensing Service). If you choose the "Enterprise" installation option, your licensing server will respond to a license request from any Terminal Server in the same Active Directory site. If Terminal Servers from multiple domains exist in that Active Directory site, the license server will provide licenses for all of them. This option requires that your Terminal Servers be part of an Active Directory domain. 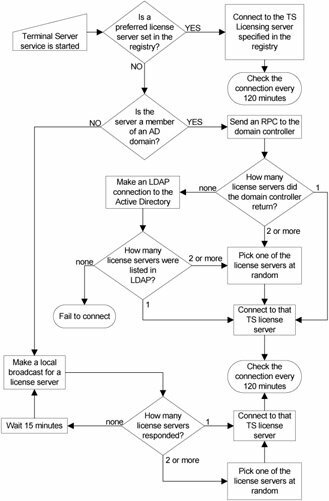 When the licensing service starts, it registers itself with a domain controller and creates a "TS-Licensing" object in the directory, allowing Terminal Servers from any domain to query a domain controller to locate the license server. Choosing the "Your domain or workgroup" option causes the license server to behave differently, depending on whether it's part of an Active Directory domain. In AD environments, this choice causes your licensing servers to only respond to license requests from Terminal Servers in the same Active Directory domain. If an Active Directory domain crosses multiple Active Directory sites, the licensing server will fulfill requests from multiple sites. This option is useful in situations where there are multiple business units partitioned into different domains on the same network. A license server from one domain won't give licenses to clients connecting to Terminal Servers from a different domain. You must install a TS licensing server within 120 days of using Terminal Services on a Windows 2003 server. (This was increased from 90 days with Windows 2000.) If a Windows 2003 Terminal Server can't find a license server after it's been used for 120 days, the Terminal Server will refuse connections to clients without valid TS CALs. Regardless of which of these four situations a Terminal Server is in, you always have the option of manually specifying a license server or servers that each Terminal Server should get licenses from. You can manually configure any Terminal Server to get licenses from any license server—there's no need to stay within domain, subnet, location, or site boundaries. Add a new key called "LicenseServers." Underneath the new LicenseServers key, create another key with the NetBIOS name of the license server that you want this Terminal Server to use. You don't need to add any values or data under this new key. Add multiple keys for multiple servers if you wish, although the Terminal Server will only communicate with one license server at a time. Once you're done, reboot the server for it to take affect. As you'll see, this manual process is needed in situations where the Terminal Servers cannot automatically "discover" the license servers. It's also useful if you want to override the default license server that a Terminal Server discovers. If the registry key is empty or if the server or servers specified there cannot be contacted, the Terminal Server performs a NetBIOS broadcast to attempt to locate a license server. (NetBIOS broadcasts are not routable, so only license servers on the same subnet as the Terminal Server making the broadcast will respond.) If multiple license servers respond, the Terminal Server remembers their names and chooses which it will use exclusively. Once the Terminal Server picks a license server, the Terminal Server periodically verifies that it exists. (See Figure 4.2.) If the license server ever fails to respond to the verification poll from the Terminal Server, the Terminal Server attempts to connect to one of the other license servers that responded to the original NetBIOS process. If no connection can be made to a license server, the Terminal Server attempts to find a new license server by starting the entire discovery process over again. There's nothing wrong with installing a domain scope license server on a nondomain controller. Just be aware than you'll need to manually configure the registries of your Terminal Servers to find those license servers. Enterprise scope license servers are not affected, since they register themselves with the domain controllers, even when not installed on a domain controller. If license servers are found, the Terminal Server keeps a list of them in its registry. Enterprise licensing servers are stored in the HKLM\Software\Microsoft \MSLicensing\Parameters\EnterpriseServerMulti registry location, and domain licensing servers are stored in the HKLM\Software\Microsoft \MSLicensing\Parameters\DomainLicenseServerMulti registry location. By storing these server names in the registry, a Terminal Server is able to quickly pick a new license server if its primary choice is not available. Once a license server is found, the Terminal Server will only start the discovery process over again if it can't connect to any of the servers in the registry. You are likely to run into situations in which one of your Terminal Servers cannot find a license server and the reason is not apparent. Fortunately, the Windows Server 2003 Resource Kit includes a Terminal Server License Server viewer tool, LSVIEW.EXE. LSVIEW is a GUI-based tool that is run on a Terminal Server. It provides you with the names and types of each license server that it can discover.